Werlatone newest connectorized 90° Hybrid Coupler is the Model QH9972. 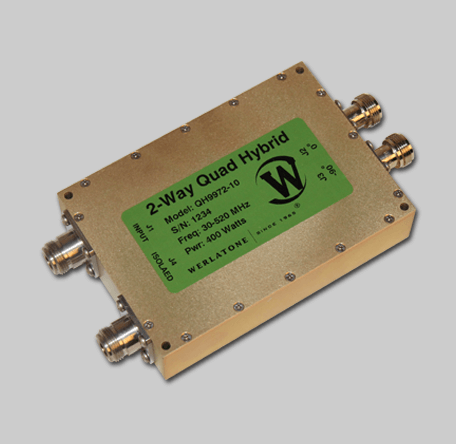 This 2-Way hybrid design covers the full 30-520 MHz band, and is rated at 400 W CW. The unit operates with less than 0.85 dB of Insertion Loss, and offers a minimum of 18 dB Isolation. Werlatone also offers a Drop-In style design, Model QH9056. Both models are robust, high power, and compact, suitable for military and commercial applications.